The injury detector we made is based on a cell-free device with three connected enzymes. HRP(Horseradish Peroxidase) is a commonly used enzyme as clinical testing reagent which catalyzes the reductive cleavage of hydrogen peroxide by an electron donor. As one of the three enzymes for diagnosis, it is of vital importance. Meanwhile, we found that SpyTag forms a spontaneous isopeptide bond to SpyCatcher, and SdyTag/SdyCatcher, SnoopTag/SnoopCatcher are the same. The tag/catcher system is a useful tool to link HRP with other protein via covalent bond. This part consists of BBa_J64997, BBa_B0034, BBa_B0010, BBa_B0012(previous parts) and BBa_K2721029(new part) which codes for HRP, SnoopTag and SdyCatcher. Flanked by SnoopTag and SdyCatcher, HRP can be connected with the other two enzymes to form multienzyme complex. We obtain the original DNA sequence of HRP, SnoopTag and SdyCatcehr from the references below. After optimizing and synthesizing, we cloned the target sequence into vector PET-26b(+) and successfully detected the production. We utilized SDS-PAGE and Western blot to detect the expression of SnoopTag-HRP-SdyCatcher. The primary antibody is Mouse-anti-His mAb. Fig. 1 SdyCatcher-HRP-SnoopTag| (A) SDS-PAGE, Lane M1 is protein marker, Lane 1 is BSA (2.00 µg), Lane 2 is SdyCatcher-HRP-SnoopTag. (B) Western Blot, Lane M2 is protein marker, Lane 3 is SdyCatcher-HRP-SnoopTag. 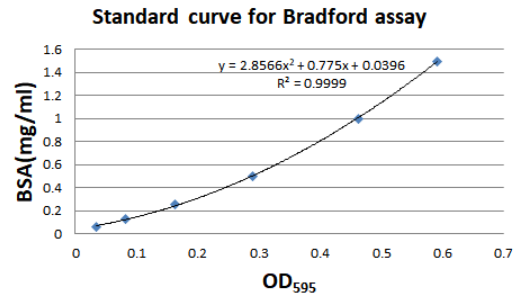 Besides, we used BSA Standard Curve to qualifity the expression of SdyCatcher-HRP-SnoopTag. Table. 1 qualification result of three complex. P Hengen. Purification of His-Tag fusion proteins from Escherichia coli. Trends in Biochemical Sciences, 1995,20(7): 285-286.